Caubeen, hackle and current R IRISH cap badge. The cap badge of a regiment is its most basic identifying emblem and much emotion is vested in such badges by members of regiments. 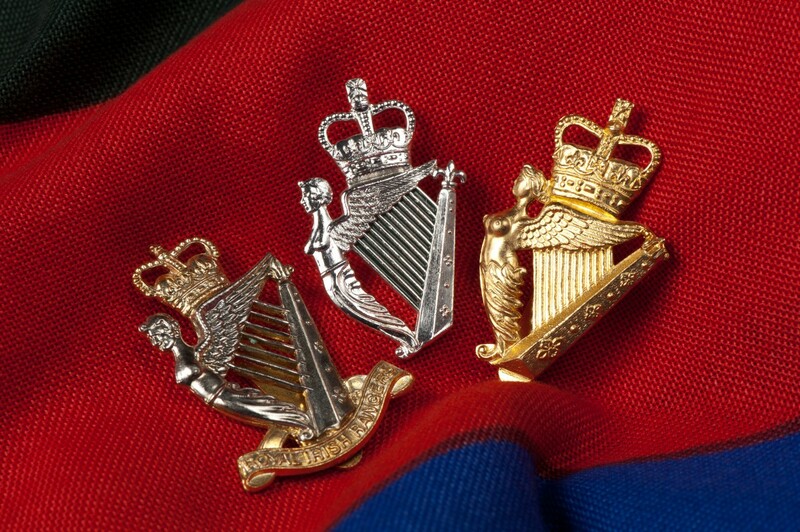 The cap badge of The Royal Irish Regiment traces a direct lineage back through The Ulster Defence Regiment to The Royal Ulster Rifles, although the harp and crown in various different shapes is emblematic of a significant number of Irish regiments. When The Ulster Defence Regiment was formed in 1970 a decision needed to be made about the badge officers and men of the regiment would wear on their headdress. 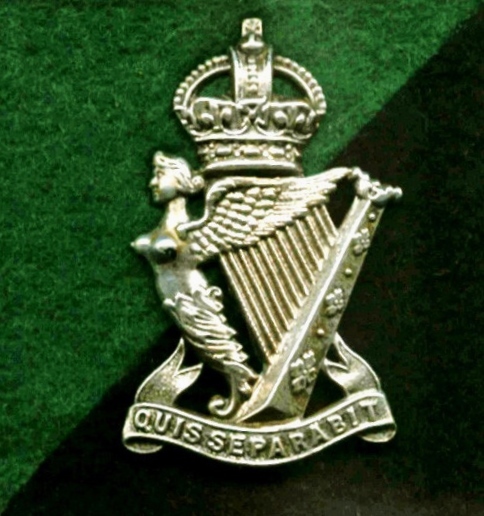 The officer who is alleged to have arrived at the solution took a Royal Ulster Rifles cap badge and broke off from the bottom of it the scroll bearing The Royal Ulster Rifles' motto “Quis Separabit”. 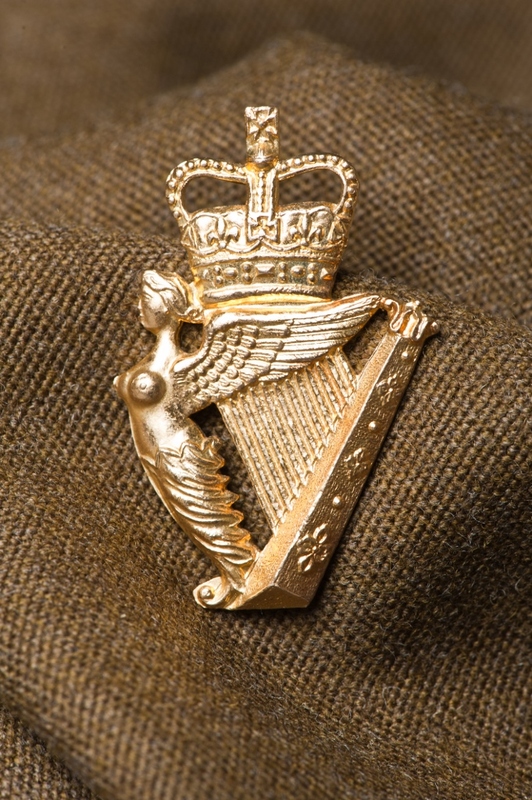 This left a simple harp and crown that was recoloured gold and worn proudly by members of The Ulster Defence Regiment until merging with The Royal Irish Rangers in 1992. 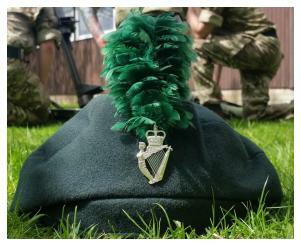 Soldiers of the new Royal Irish Regiment continued to wear the gold coloured UDR cap badge in berets whilst officers wore an embroidered silk and wire cap badge on green backing cloth sewn onto the beret. Later, a new silver cap badge was issued to all ranks to be worn in the caubeen, the formal headdress worn by soldiers of all the antecedent regiments and by The Royal Irish Rangers. The green caubeen was adopted as formal headdress by The Royal Irish Regiment and is still worn most distinctively with the green hackle. In 2009, the cap badge was very slightly reworked into the representation worn today; fundamentally the same cap badge but with a green enamel backing between the harp strings and overall, a finer finish.